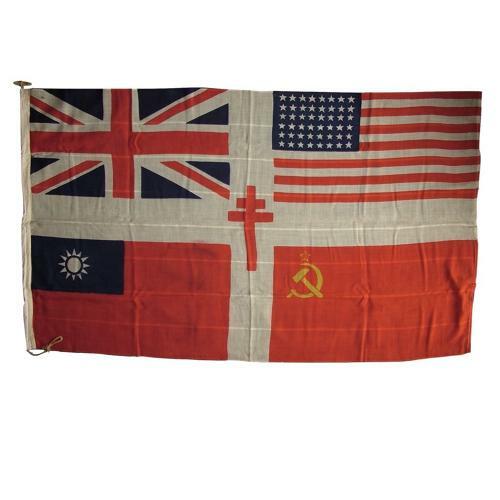 Superb large Allied forces flag featuring the British Union flag along with American, Chinese and Russian flags, all surrounding the Free French Forces Cross of Lorraine. Approximately 111 x 193cm (44 x 76"). Printed on a fine woven woollen fabric. With cotton binding tape edge and jute rope with wooden toggle fittings. The cloth has some moth and fray holes but is in good overall condition and colours remain clear and bright. An impressive flag and fabulous display piece. A rare flag almost certainly designed and produced in the United Kingdom during the war as a patriotic piece or immediately postwar as a celebration of victory. Stock code M19784.